The shuttle its self cannot take off and fly under its on power. That is why the shuttle carrier aircraft is needed. In June 1973, the Boeing firms receive appropriations for the study of two fuselage of B 747 joined together by a central wing, on which the shuttle would be posed. Boeing takes up the idea in October with one 747 and gains the contract in June 1974. The 747 is a plane of 150 tons to vacuum which can transfer onto 10 000 km 500 people. It has 70,5 m length, for a scale 59,64 m and a height of 19,33m, it is largest of the airliners. The 747 series of aircraft are four-engine intercontinental-range swept-wing "jumbo jets" that entered commercial service in 1969. 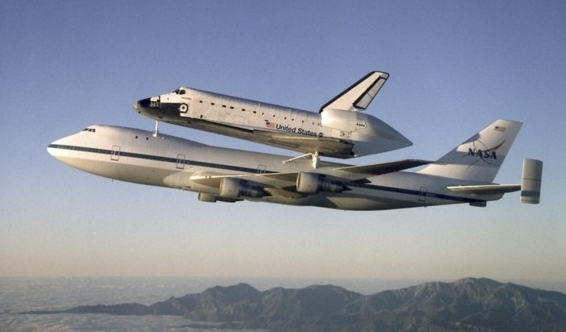 NASA uses two modified Boeing 747 jetliners as Space Shuttle Carrier Aircraft (SCA). One is a 747-100 model, while the other is designated a 747-100SR.